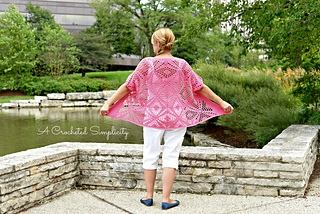 Join us for a Crochet Along with the Reina Cardigan, find all of the details here. The Reina Cardigan is a slightly oversized, stylish garment that can be worn year round. Using simple techniques to create a sophisticated look, you’ll be amazed at how quickly this one works up! Yardage ranges from 860 - 1,300 yards depending on the size you’re making. A complete chart with sizing and yardage is included in the pattern. Cardigan design is an A Crocheted Simplicity original design. All of my patterns are written in standard american terms, unless noted otherwise. Please note that due to the nature of digital files I cannot take any refunds, however, I do offer customer support and will try my best to help you with the instructions. © 2017, Designed by Jennifer Pionk aka A Crocheted Simplicity. All Rights Reserved. This design, the pattern, and the images are property of A Crocheted Simplicity. The buyer may use this pattern for personal use and charity. Sales of finished items are also permitted, credit given to A Crocheted Simplicity is greatly appreciated. No part of this document may be reproduced, altered, or distributed in any form, or by any means, without express written permission from Jennifer Pionk.